A bogey-double bogey start left Woods scrambling to stay close Thursday. 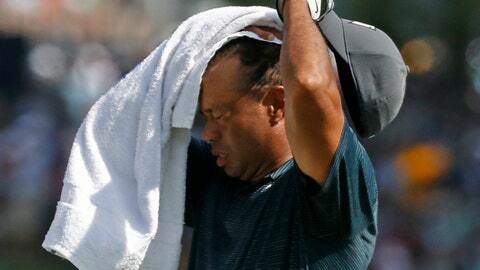 After having his caddie grab his backup shirt from the bag, Woods popped into a restroom near the 12th tee box, put on the dry shirt and shot 3 under the rest of the way to finish at even-par 70. That kept him within six shots of the first-round leader, Gary Woodland. His tee shot on the 11th landed in the left-side rough, 120 yards away, with the most direct line to the hole crossing a pond. Woods said he wasn’t aiming at the pin. The ball hit the top of the hill and bounced back into the water. Woods had to scramble for a 6, and was 3 over before he grabbed his backup shirt, which seemed to make a difference. Three weeks ago at Carnoustie, Woods was five shots behind, in a tie for 32nd, after the first day. He held the lead Sunday before finishing three back, in a tie for sixth.